The winds are blowing in great gusts. The leaves falling by the masses. We run fast, trying to catch them mid-air. We cannot grab a single one. They are too quick, the wind scattering them in all directions. No matter. You laugh and squeal until the wind takes a moment’s rest. “Momma!! !” You point to the new bunch suddenly taking flight. We turn course and chase again. I am breathless with love for you. The thrill in your eyes, the joy in your voice, the leap in each step. You, my dear girl, have made this season better than anything I could have ever imagined. I had mourned the end of summer. No more. Nothing compares to this moment, chasing leaves with you. Fall is here and I have embraced the chill. What about you?? What is your favorite thing about this season? I would love to hear it! Previous Post Baby Wit + Giveaway! It’s unfortunate that we don’t have fall in the Philippines. But then again, fall signals winter so I’d much rather have my hot and rainy “seasons”. But, among the four seasons on that side of the world, autumn is my absolute favorite – with all the colors and that easy, chilly weather. Tricia, I love you can see it!! I was really hoping it could be grasped! Lovely Sasha. I love the fall too. The colors, the crisp air, the fall fairs & all the yummy fall treats make it my favorite season. The festivities simply are the best of the year!! Sasha I love how you write!!!! We love apple pie and apple butter this time of year that we make from our apple tree. But my very favorite is watching squirrels climb up on our porch and nibble away at our pumpkins. Love your photo too. Your own apple tree!! How awesome is that!!! How I would love to come have a slice of apple pie with you right now! I wish you could too!!!! Sasha, beautifully written. We love fall too, especially pumpkin patches and all pumpkin flavored foods. That is a wonderful picture!! I just love Thanksgiving. I feel like it gets lost between Hallowwen & Christmas. But it is such a great holiday to teach kids about thankfulness. 🙂 And adults too! I am becoming a much bigger fan of Thanksgiving than Christmas here lately. Although the message of Christmas is good, it is so quickly swallowed up in everything materialistic. Thanksgiving’s message seems to still be heard strong. I am loving this opportunity to teach my kids about begin thankful (and reminding myself as well!). I love the color of the leaves it is just beautiful. My daughter loves it, I also love the fact that I can start wearing my scarfs. Fall is here and I have no complaints. You are such a good writer! I love the feeling of transition as well but still long for summer days. I absolutely love Fall. It is my favorite season. I was born in late September. But aside from my birthday, I love the color of the trees, the fashion, the beautiful reminder everyday of the holidays getting closer, and just the crisp air and smell Fall has. I seriously love everything about it. Thanks for sharing! I do love Autumn, even though I love summer I am ready for things to change by October. It’s a beautiful season with it’s colours and crisp feel to the air. Although my favourite season is spring. It’s new and fresh and signals the start of long days and more hours spent enjoying the outdoors. Oh Sarah, the new dark at 5pm is killing me! I too will gladly embrace the long days again! Gorgeous photo Sasha! That’s the thing about children – they haven’t decided this or that is good or bad, so it frees us from those decisions as well. I love autumn, but we don’t head into the kind of brutal winter that you guys have so there isn’t the sadness/dread (that’s more spring 😳). All of our birthdays (partner, children and me) fall in our autumn! This is gorgeous! You capture the exhilaration and the sweetness of the moment perfectly! I am guessing you live much further south than me. 100 degrees–I thought I was melting in some of our high 80s here. 😉 Enjoy each moment of this cool relief! Oh I love fall…if only we had like at least 50* weather like when I was a kid and could enjoy it. The colors are so beautiful. I want Little Man to be able to go out and stomp through the leaves but it’s been so chilly here in the Midwest. He did find a ginormous maple leaf yesterday and was pretty stoked about that. So sweet, simple and beautiful! It really is the simple moments with them that are truly the most magical! I do miss fall… It’s beautiful!! Red and orange leaves blowing from the branches and covering the ground… We don’t get that here.. Enjoy! The thought that spring is just a few months away? I am trying…:) A beautifully written piece, as usual! Beautiful picture! I love fall also. I love all of the vibrant colors and the way the falling leaves look against sometimes gray skies. I love to watch my children jumping in the leaf piles and throwing the leaves up into the air, seeing their pure enjoyment of it. I love the way you captured that moment. That overwhelming love is the best feeling in the world. I wish we could stay in autumn all year long!! 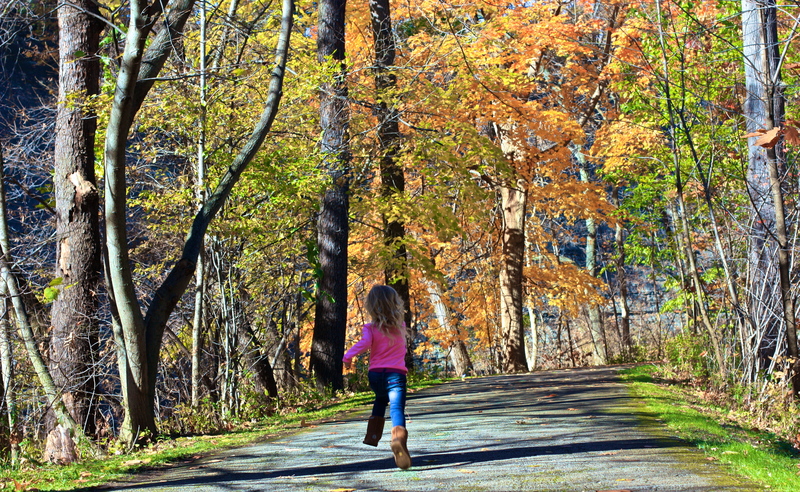 I love the smell of fallen leaves….and love crunching through fallen leaves,too! !